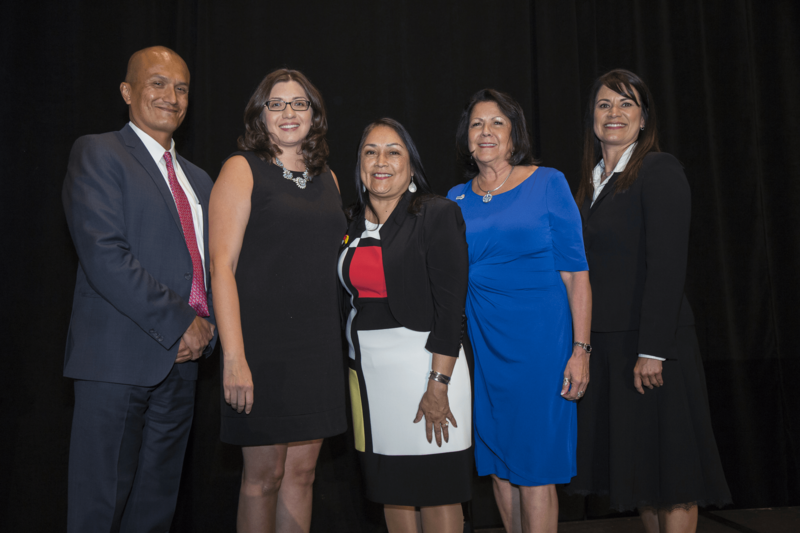 Phoenix, Arizona—The Native American Finance Officers Association (NAFOA) elected a new President and 2nd Vice President of the Board of Directors, marking the beginning of a new era in tribal economic development. This year NAFOA celebrated its 34th Annual Conference that not only surpassed previous attendance levels but also welcomed new leadership. Cristina Danforth was elected as the new President of NAFOA and Christina Jimerson was elected 2nd Vice President of the organization. Cristina Danforth is currently the Chairwoman of the Oneida Nation. Danforth has served Indian Country in a variety of capacities and has experience working in social services, economic development, banking, and education. Prior to her position as Chairwoman, she was Treasurer of her tribe for six years and on the governing council for seventeen years. In addition to her service for her tribe, Danforth volunteered her time on the NAFOA board as 2nd Vice President since 2009. She also currently the Treasurer of the Great Lakes Inter-Tribal Council, a consortium of eleven tribes in Wisconsin, Michigan, and Minnesota. Christina L. Jimerson is a citizen of the Seneca Nation of Indians of the Bear Clan and resides on the Cattaraugus territory. Jimerson currently serves her tribe as a Councillor, a position she has held since she was elected in 2012. During her tenure, she has been active in NAFOA and the National Congress of American Indians, especially in advocacy related to tax issues affecting Native Nations throughout Indian Country. Jimerson holds an MBA from Canisius College and a bachelor degree in Health Services Administration from the State University of New York at Fredonia. NAFOA’s 34th Annual Conference was held on April 18th-April 19th at the Sheraton Wild Horse Pass Resort, owned by the Gila River Indian Community, in Chandler, Arizona. Member tribes and conference attendees were invited to nominate individuals for President and 2nd Vice President. Votes were called on Tuesday, after which the results were announced in favor of both women at the 9th Annual Leadership Awards Luncheon. NAFOA launched over three decades ago as the Native American Finance Officers Association to highlight the role of tribal finance in fostering economic opportunities. Since that time, NAFOA has grown along with tribal economies. Today NAFOA advocates sound economic and fiscal policy, develops innovative training programs in financial management, builds the financial and economic skills of the next generation, and convenes tribal leadership, experienced professionals, and economic partners to meet the challenges of economic growth and change. NAFOA is headquartered in Washington, D.C.
Board Members from left to right: Dawson Her Many Horses, NAFOA Secretary: Christina L. Jimerson, NAFOA 2nd Vice-President: Cristina Danforth, NAFOA President: Varene Martin, 1st Vice-President: Kim Peone, Treasurer.